Labrador Retrievers were bred to retrieve from water, and it’s widely known they love to swim. But, how much? And, given their sociability, do they prefer to swim rather than mix with a person or another dog? A study by Sara Tavares, Ana Magalhães and Liliana de Sousa (University of Porto) gave Labs a free choice, and says the results are important for good animal welfare. On 3 separate occasions, dogs were given a free choice: taken to the pool area and left there with one other dog to play with, the water to swim in, or a human to approach. The human was someone they had seen once before, but was in a closed area so they were visible but physically inaccessible to the dog. The person spent one minute gazing at one of the dogs and then a second minute gazing at the other dog. Then the dogs were taken away. At all times, the dog’s handler was hidden away, just in case help was needed to assist a dog in getting out of the pool. Each dog was observed for 6 minutes in total across the 3 trials. Video recordings enabled the researchers to time how long each dog spent interacting with the water, the other dog, or the person. Guess what? The water won! Dogs approached the water more, and spent more time interacting with the water, than either the person or other dog. Every single dog approached the water. There were differences in how each dog played in the pool: 6 touched it with their muzzle, 5 put their front legs in the water, 4 of them went for a swim, and 1 pawed at the water from the side of the pool. This suggests there are individual differences in what dogs like to do at the pool. (It’s worth noting that before the study, the owner said 2 dogs loved to swim, 2 were not interested in the pool, and the rest were in between). Labrador Retrievers are built to swim, with webbed toes, a unique tail shaped like an otter’s, and a water-resistant coat. Before being bred in England, they originally came from Newfoundland, where they retrieved nets and fish from the sea. So this raises questions about providing opportunities to swim for Labradors (and other water-loving breeds). There’s a more general principle too: If there’s something your dog enjoys – like to swim or to fetch or play tug – isn’t it nice if they can do it? 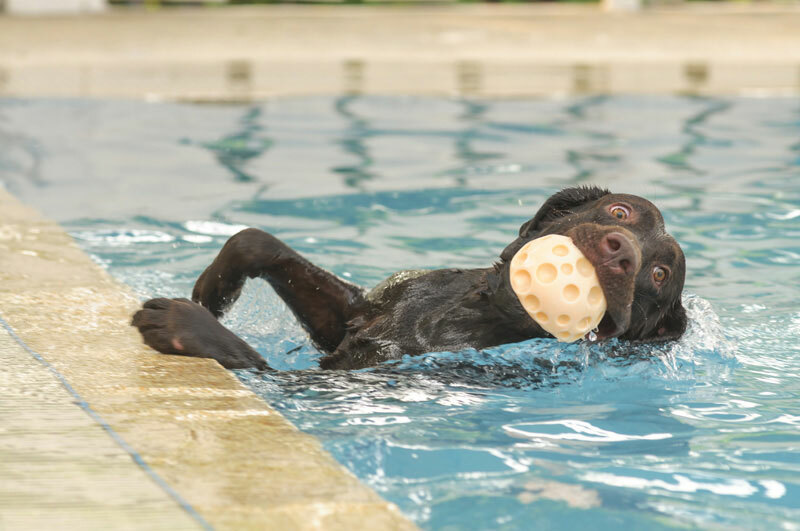 Of course, not all pet owners can provide a swimming pool for their dog, but there may be other ways to allow access to water for splashing in. One drawback to the study is that the dog couldn’t reach the person if they wanted to, and this may have stopped from attempting it. Also the person’s gaze was fixed, and not responsive to the dog, so it wasn’t like a normal interaction with a person. So although we can conclude these dogs like water, we can’t assume they like it more than people. The dogs were 2-13 years old. One was a trained assistance dog, and one other was in the process of assistance dog training. This was a preliminary study, and future research with more Labradors is needed (won’t that be fun for the dogs?!). It would be interesting to compare breeds, too. Does your Labrador Retriever get free play time in the water?